IT WAS yet another meeting in a series that began six years ago. On July 28, close to 40 members of Parliament and state leaders met in Room 124 of Krishi Bhavan, the Delhi headquarters of the Ministry of Agriculture, in what seemed a last-ditch attempt to thrash out the contested points in a proposed law to regulate the seeds trade. The meeting was called by Minister for Agriculture Shared Pawar, who had put together the first draft of the Seed Bill in 2004, and is set on getting it passed during the current session of Parliament. The amended Seed Bill, 2004, is a critical piece of legislation and could underpin the success—or failure—of Indian farming. The preamble says the bill aims "to provide for regulating the quality of seeds for sale, import and export and to facilitate production and supply of seeds of quality", but its stated objective has not found favour with farmers, several state governments and the Left parties. The reason is simple: missing in this law is any mention of price regulation. That is the core issue, although there are other concerns, ranging from the amount and method of compensating farmers who incur losses on account of poor quality seeds to the bill's conflict with other pieces of legislation. The July 28 meeting addressed most of the 'other concerns', with Pawar listing out the various amendments that the government would incorporate in the amended bill to be presented to Parliament. But on the question of price regulation, the minister was unwilling to budge. A note circulated by the agriculture ministry at the meeting is categorical that the bill does not envisage any "provision for price control" and is intended purely to regulate the quality of seeds. According to several invitees to the meeting, the agriculture minister told them that "the prime minister is against any price control". This leaves a big question mark hanging over the Seed Bill since opposition to it shows no signs of a let-up. Leading farmers' organisations accuse the UPA government of Manmohan Singh of selling out the farmer to multinationals. Krishan Bir Chaudhary, president of the Bharatiya Krishak Samaj, believes the bill "is to protect the interests of multinational seed companies like Monsanto", which, he insists, are trying to capture the seed market in India. There are other outfits like the All India Kisan Sabha which voice similar worries—and accusations. Congress-ruled Andhra Pradesh is the biggest opponent of the bill and its agriculture minister N Raghuveera Reddy has been campaigning ceaselessly for significant changes in the proposed law. Reddy, who participated in the July meeting, told Down to Earth that "states must have the power to fix the price of seed and trait value (the royalty paid on patented seeds) whenever necessary." As he sees it the system should involve both the Centre and the states. "We would like an independent body similar to CERC (the Central Electricity Regulatory Commission fixes tariffs and other issues related to the power sector), which oversees state regulatory commissions. Otherwise, the seed companies will squeeze the farmer." Raghuveera Reddy, who has the full backing of his chief minister K Rosiah, points out, "You simply cannot have a free market without a statutory regulator." This is the quandary that the UPA government finds itself in. Not only is the farm lobby and the Left against the bill but so is a major state ruled by the Congress. 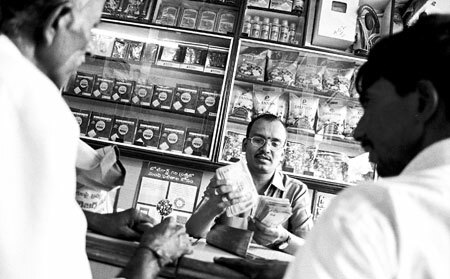 Andhra Pradesh's role, in fact, is central to the fight for regulated seed prices in the country. Since 2006, it has been taking on the US biotech giant Monsanto on the trait fees it charges for its genetically engineered cotton seeds (sold as Bollgard and Bollgard II). The state says the trait fees charged by Monsanto's marketing arm in India, Mahyco Monsanto Biotech (India) Limited, are predatory and monopolistic. But it is a course that has led to a long legal challenge—and a new state law to control prices. Gujarat and Maharashtra, apart from Madhya Pradesh and Karnataka, quickly followed Andhra Pradesh's example. It was a revolt by the states but the Centre did its best to thwart it by deploying the Essential Commodities Act or ECA strategically (See Also: Games the Centre plays). While this backdrop is essential to understand the politics of the Seed Bill, there is another factor: the differences within the Congress high command on the issue of price regulation. The reservations of Congress Party chief Sonia Gandhi are said to be instrumental in putting the proposed law in cold storage for the past four years. As chairperson of the National Advisory Committee, Gandhi had, in an October 2005 letter, warned, "There is a growing perception that the Seed Bill, 2004, is anti-farmer and that it favours the seed industry and large seed breeders, including MNCs. Government has no mechanism to control prices. Seed suppliers are under no obligation to ensure reasonable seed supply to farmers." That concern, however, has not been addressed in India so far, although elsewhere, notably in the US, the runaway price of seeds is inviting judicial scrutiny. Simultaneously, seeds giant Monsanto, a big player in the Indian market, is also being investigated across seven American states for unfair or deceptive practices (See Also: Prices under the scanner ). Sometime back, the UN's Special Rapporteur on the Right to Food had warned that the increasing dependence on commercial seed varieties, "controlled by a handful of very powerful multinational companies", could have a severe impact on small farmers in developing countries. Many of the recommendations of the Standing Committee of Parliament, which gave its report in 2006, have been incorporated in the 2010 version of the Seed Bill, but price stubbornly stays out of its ambit. The agriculture ministry's stance is clear. 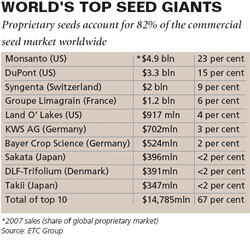 "A free and competitive market environment will spur the growth of the seeds industry. Therefore, price is better left to market forces rather than to artificial controls." Noted agriculture scientist M S Swaminathan said: "I hope better counsel will prevail." Now a member of the Rajya Sabha, Swaminathan, too, has been demanding price regulation in the bill. "I have said there should be price regulation where appropriate, not everywhere. The government should have the authority to use price controls in certain situations, but not to usurp the role of the market." The scientist, who is referred to as the Father of India's Green Revolution, worries that lack of price control could have disastrous consequences for the Indian farmer in accessing new technology. "High seed prices and trait fees," he warned, "will come in the way of social inclusion on technology access—and social inclusion is fundamental to growth of the sector." 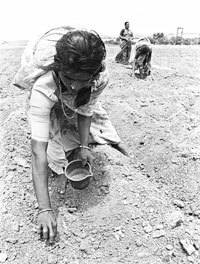 The government's point that the earlier law—Seed Control Order, 1983, which the Seed Bill will replace—did not have any provision for price control either is specious, said G V Ramanjaneyulu, executive director of the Centre for Sustainable Agriculture in Hyderabad. "It is clear that the government's objective now is to encourage private trade". There are concerns, too, about the opening of other doors to private companies, local and foreign. For instance, Swaminathan and CPI leader D Raja say that seed certification issued by foreign agencies should be recognised only if the seed is tested on Indian soil. However, the ministry argues that Clause 30, which allows the Centre to authorise any foreign certification agency working outside India, is intended to allow global trade in seeds, and would come within the scope of bilateral and multilateral trade agreements. But Ramanjaneyulu says there is a contradiction on the role of foreign agencies. At one level the ministry has assured the Andhra MPs that their demand that "certification should be carried only by government and semigovernment agencies" would be incorporated in the amendments. Yet, in another instance, it said foreign and foreign- based agencies would be allowed to do so under foreign trade pacts. "In place of truthful labelling of seed, the government is making certification compulsory, but this is geared to letting in private and foreign seed certification agencies into the business," pointed out Ramanjaneyulu, former ICAR scientist. Besides, it would also permit multi-location trials to be carried out by private agencies on foreign soil. The ministry's justification is that seed imported into India would be subjected to multi-location trials under the rules to be framed under the Seed Act. As for that most vexing issue of compensation to farmers in case of seed failure, an issue that exercises most critics of the bill, the ministry says the quantum of compensation and the mechanism to recover it will also be prescribed under the rules. The demand for "a role for panchayats, state and district level committees can be considered at that stage," according to the official note. Have the opponents of the bill been assuaged by such promises? Raghuveera Reddy, for one, is mobilising more support from the states. Last week, he wrote to all state agriculture ministers inviting them to Hyderabad for talks. "We should rise to the challenge since our farmers' interests are at stake. I have also asked them to mobilise opinion among their MPs and political leaders." Whether this seasoned campaigner succeeds in getting like-minded states on board—like he did on the BT cotton issue in 2006—or not, Pawar and the Centre know that the battle could turn bitter. Agriculture is a state subject, and the passage of the bill, which would repeal all other seed laws, including the applicability of ECA and the special ordinances passed by state governments on price regulation, is bound to ruffle constitutional feathers. In the latest memorandum sent to the prime minister and the agriculture minister, the Andhra Pradesh chief minister has demanded the inclusion of a separate chapter on seed pricing and royalty fees which would give equal powers to the states and the central government. He has also detailed the mechanism for this procedure. In a telling remark, Andhra Pradesh points out that the power to fix royalty rates is available with member-states of WTO under its TRIPS Agreement on intellectual property issues. It remains to be seen if the Centre can be persuaded by such arguments.